If there is one thing I like to do, it is to accessorize. I tend to lean towards classic clothing (with the occasional trendy pieces mixed in) and add fun accessories. One of my favorite easy and fun ways that I like to accessorize is with bracelets. Whether you call it the "stack," the #armparty, or your #armcandy it is definitely a way to accessorize that anyone can pull off! Below are the items that I deemed "essential" for creating a great #armparty! The watch: While some may not be a big fan of watches, I certainly am. Up until a few years ago I didn't wear watches, but now I can't go without wearing one! It allows me to tell time and add a little fun to my arm! I also love that watches come in a wide variety of price points and styles. Whether you are aMichael Kors gal or Anne Klein is more your budget, there are choices for everyone! The link bracelet: I absolutely love the look of link bracelets. They seem to add a little bit of class (and sass) to every stack! I have one that is Lauren by Ralph Lauren that I wear religiously! The bangle: Oh, the bangle...where to begin? There are so many options in bangles that it is unreal! From the Kate Spade Bow Bangle to the printed J.Crew bangles- there are an abundance of choices! I am always finding cute bangles (at great prices!) My latest finds have been from Target. The best part?? They seem to fit my teeny tiny wrists without falling off! Bangles are the perfect way to add color and pattern to your stack. The cuff bracelet: These to me are "every day" type bracelets. They are pretty simple, yet can be paired with other bracelets to make the perfect stack! I love my David Yurman cuff bracelets and they rarely leave my wrist. Lately I have been seeing simple cuffs (like the gold ones above) that are just as cute and simple. Bauble Bar always has some cute ones! The dainty bracelet: Some of my favorite bracelets are light, dainty bracelets that can be worn in multiples to make a cute (and light) stack. Target has a great selection of dainty tie bracelets that I love to wear in the summer, especially when it is so warm and I may be sweating a bit!! My Stella & Dot Renegade Cluster is another one of my favorites. It is a little trendy, yet still dainty enough to wear with most other bracelets! 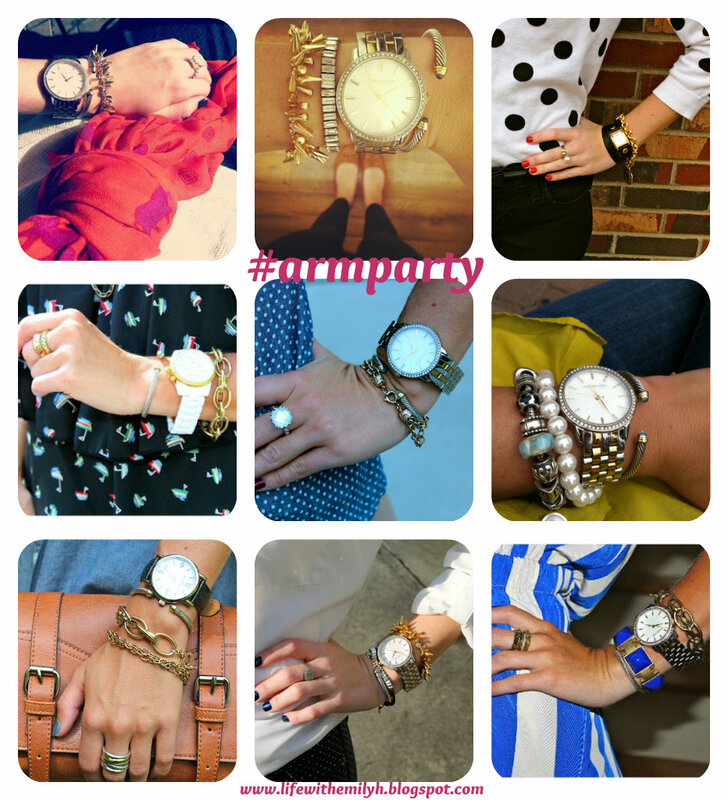 How do you stack your #armparty? Where are your favorite bracelets from?